A view of the tricky elevated green of the par 4, 13th hole of the Bandon Trails Course of the Bandon Dunes Golf Resort, Bandon, Oregon. The tee shot must avoid the large bunker on the left and the woods on right. The green is narrow and crowned and an approach missing to the left will end up at the bottom of a deep depression and a miss to the right will end up in a very deep bunker or in a seasonal wetland. 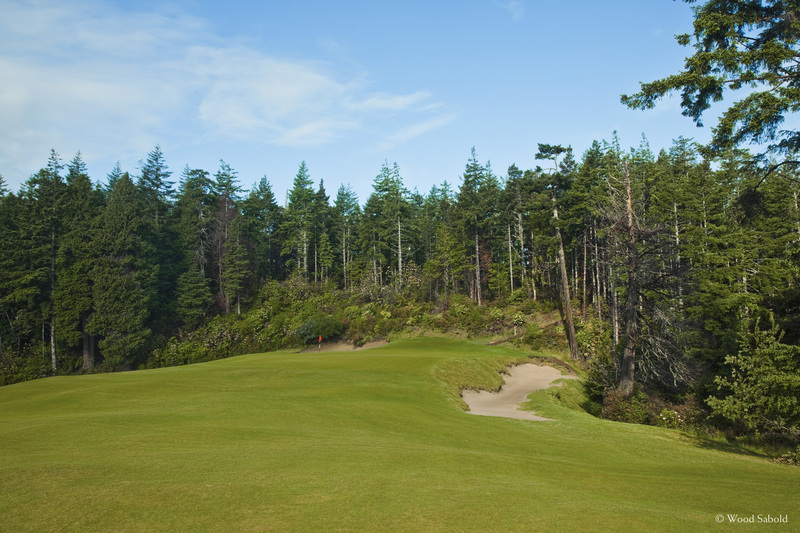 The background of the green features native rhododendrons that bloom in May and June. Bandon Trails is the third course of the acclaimed Bandon Dunes Golf Resort. The course opened in 2005. Architect, Bill Coore and Ben Crenshaw.